When purchasing a Volkswagen Bus, you need to know which type you are looking for. The most popular one in the United States and Europe is the Type Two light commercial vehicle. It comes in three different body types, the Transporter, Kombi and MicroBus. 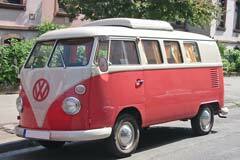 They come in a 4-door panel minibus or van body and have been in production since the 1950’s. Some vans are very old and are already plagued with rust. Because of this reason, restoring an older Type 2 vehicle is quite difficult. Although the body types do vary, they generally have the same wheelebase. They come in a 1.6 L at entry level and go as big as a 2.0 L engine. These vehicles use up a lot of gas and is not for someone looking for a car based on good fuel economy.